I used 3 thin coats of Grand-plié In Black and 1 coat of Seche Vite. The polish applied fine, but I wish the glitter would show up as much on the nail as it does in the bottle. If you click the pictures for an enlargement it shows better though. 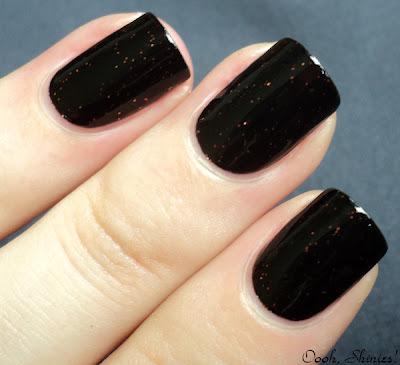 Blogger Inspired Mani: Another Bottle Of Polish?! Something Sweet and Big Spender Wanted! Wood and a ... eek! Now that's a green mani! The previous mani, now with flakies!